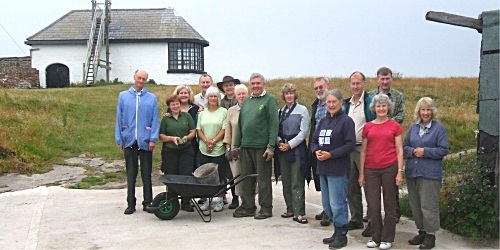 It is great fun taking part in activities on the Hilbre islands. However the islands are cut off from the mainland, by the tide, twice a day and there are steep cliffs and tidal gullies. The advice and precautions below will help you to have a safe, comfortable and enjoyable time on Hilbre. • If it is your first time volunteering please make yourself known to the task leader, at the meeting point at Dee Lane slipway, West Kirby, or e-mail thefriendsofhilbre@hotmail.com and we will make sure that we look out for you. • Please keep to the ’meet’ and ’leave’ times stated when volunteering for Tasks Days on Hilbre Island to ensure a safe crossing to and from the islands. • Information boards, by the slipway in West Kirby, show the daily safe crossing times and the safe route to walk to the islands. • Public toilets are found in the building near Dee Lane slipway, West Kirby should you wish to use them before crossing to Hilbre. There are composting toilets on the island. • There is no drinking water on the island. Please bring enough to drink for the day (not alcohol!!) and a snack. Bring warm clothing, gardening gloves and waterproofs; wellies may be a good idea! • Most of our work is ongoing and we draw on our database of volunteers for the appropriate work in-hand.